Stan Carter had boarded a landing craft at Tilbury loaded with 200 tons of ammunition destined for the Airborne Division which had flown in by glider to take Pegasus Bridge. 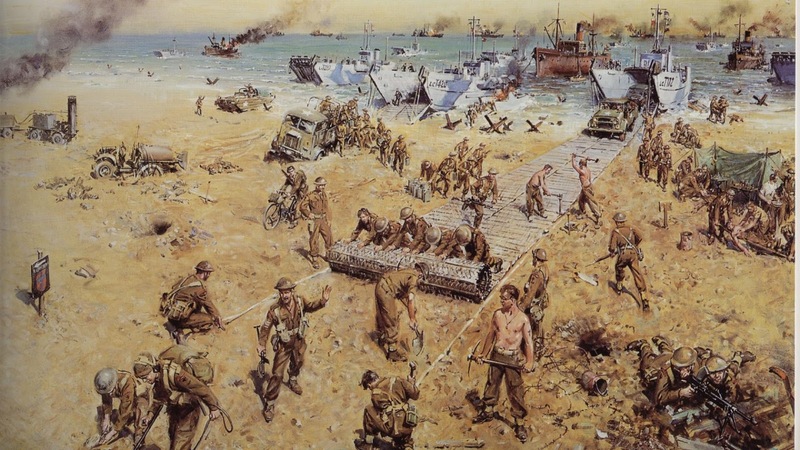 The job of Ordnance Beach Detachments was to follow on quickly behind the assault troops and set up ammunition dumps just behind the beaches ready to issue ammunition to replace that used in the initial assault. The 21st Army Group was to invade three beaches: Gold, Juno and Sword. Each beach had attached to it Ordnance Beach Detachments and Ammunition Companies. Advance parties came ashore within an hour or so of the first assault troops and created sector dumps just off the beaches. The main stocks were anti-tank and anti-aircraft ammunition, Landing Reserves, stretchers and blankets for casualties and survivor kits. These latter were complete changes of clothing and kit for soldiers who experienced a ‘bad’ landing. Landing Reserves were designed to supply troops with spare parts for the first four weeks and comprised 8,000 cases calculated to maintain a brigade. Stan had been promised a dry landing but in the event was offloaded into 5ft of water some 15 yards from the sand. To make matters worse his job, with one other, was to pull a handcart to carry the ammunition from the craft up the beach to the dump, and all under mortar fire. Accounts of other landing craft laden with ammunition talk of DKWS being used to transport across the beach. 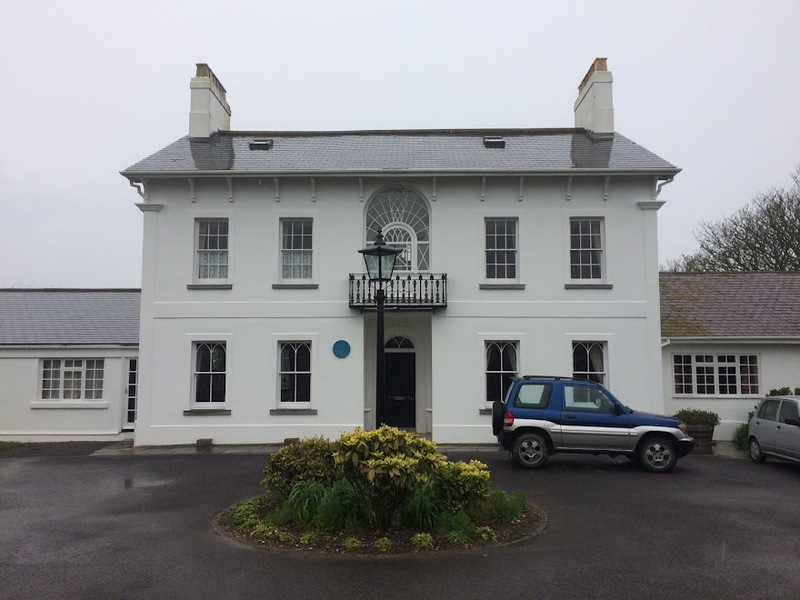 I noted, from the War Diaries of Brigadier Readman at Chilwell, that right up to D Day there had been a problem with supplies of DKWS. Perhaps Stan’s craft drew the short straw and so ended up with the handcart. 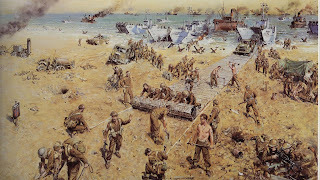 Just as Stan made it up the beach the first time, the Bren carrier next to him ran over a mine and some of the resulting shrapnel embedded itself in Stan’s thigh. He didn't remember pain, rather the need, with his mates, to get on with the job. The ammunition was duly stacked and issues made, again all done under fire from German mortars only yards in front. Stan recalled that once on the beach all the good intentions to keep records of issues went out of the window. A mortar hit an adjacent petrol dump and burning petrol spread toward the ammunition. Stan spoke of his Captain’s bravery in putting out the fire with his bare hands, an act which cost Captain Thompson his life. The wound in Stan’s thigh couldn’t be left and so he was taken to the field dressing station and from there back to England. He did return to France and his story continues later.